The Linksys Smart Gigabit Switch (LGS308, LGS308P, LGS308MP, LGS318, LGS318P, LGS326, LGS326P, and LGS326MP) offers a quick and easy solution to extend your office network. The switch features gigabit speed ports, a web-based setup page for easy configuration and management, and PoE+ support for networking devices to be located anywhere without the need for alternating current (AC) outlets. This article will provide you the instructions on how to access the switch’s web-based setup page. Open a web browser and enter "http://192.168.1.251" in the Address bar and then press Enter . NOTE: The switch’s default IP address is 192.168.1.251. 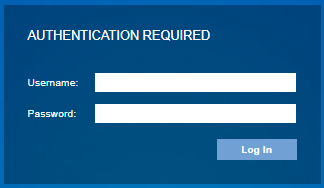 Enter the Username and Password in the login page. NOTE: The default username and password is "admin". You have now accessed the web-based setup page of the switch.